I abandoned The Japanese Lover by Isabel Allende today. I had intended to read it for both Spanish Lit Month and the Japanese Literature Challenge 9, but I tired of feeling I was outside of the book, separated from the characters by a relentless narrative of facts. Normally, Allende’s writing completely engrosses me, particularly with The House of Spirits, and I’m not sure if it’s her or if it’s me to blame for becoming frustrated. For I am rather excellent at being frustrated these days. The sinus infection from a tooth implant gone awry has lasted my whole entire summer, which I wouldn’t mind so much if it didn’t have an accompanying thump in my upper jaw. And with the arrival of August is the arrival of a new school year, at least in my part of the world; the first day of school for the dear children and I is August 20. Twentieth. Which is still summer as far as I’m concerned. And, there’s Women in Translation month for which I plan to read the third book of the Neopolitan novels, Those Who Leave and Those Who Stay by Elena Ferrante. I hope to get in another Japanese novel as well, quite possibly Asleep by Banana Yoshimoto. 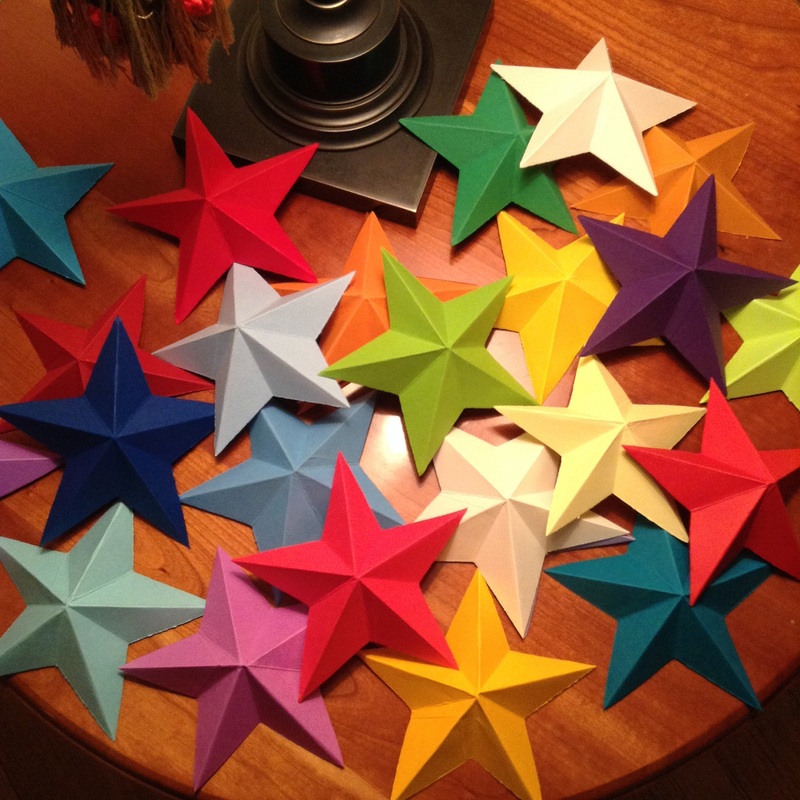 And, I’m folding the most beautiful stars for my classroom. There are many, both big and small, which I will string on invisible thread to cascade down from the ceiling at the back of my room. Because if you’re going to be hot, in an un-air-conditioned upper room at school when you should be at the beach, you should at least have something pretty to look at. Your stars are beautiful! One of the great joys of my life these days is that, since my cataract surgery, I can see the stars again. Of course I have to move away from the city lights a bit to do it, but still…. Speaking of kids and school, I just sent off some buffalo fur from my Kansas trip to two youngsters (home-schooled, I think) who are studying buffalo. Or, at least they’re interested in them. They came to mind because they live in Downers Grove. I thought the name sounded familiar, and when I looked, I saw it’s roughly in your neighborhood. I’m getting ready to read “The Mathematician’s Shiva.” I’m eager to do so! And yes, Downers Grove is a wonderful town adjacent to us, the one I went for the release of Harper Lee’s Go Set A Watchman a week or so ago. What lucky children to receive your gift. I even remember seeing buffalo myself when I would go on cattle trips with my father as a child. Who would think that now children hardly know what one looks like? Sorry you’re still dealing with tooth problems! An un-air-conditioned upper room? And heat rises? Yikes!! I won’t start a rant here. Those who’ve blogged with me since I began in 2006 know how difficult it is for me to begin teaching without air. I’m so frustrated, and now I’ll stop. I love those editions of our Jane! What a nice find! And your stars are lovely…lucky kids. Thanks for enjoying the stars, Audrey. I hope to post a photograph of the finished project. I really like to make things for my classroom rather than buy them. And, it’s so fun to teach the children origami as a special treat. The stars are beautiful dear Meredith. I do not know what the temperature has been in your corner of the world, no matter, it has been hot just about everywhere, except for one morning this summer when it snowed in Hawaii…yes ! August is always the hottest month of summer, it is when Paris closes their doors and head to cooler regions. Even a small air conditioner would help or a portable one. What a terrible summer you’ve had with your mouth issues. I do love your colorful stars — your students are lucky to have you to brighten their days. Thank you, Diane. In fact, the array of colorful stars almost remind me of the colorful chairs in your header! Color is a beautiful thing, and I often miss it with my black and white “woman” photograph. What beautiful stars! Love them. Honestly, I can’t believe there are still unairconditioned classrooms around. I guess I can see that because the summer is ‘shorter’? No, not even then. Reminds me of school here when I was younger. The first part was brutal and then finally the A/C came along. I am so sorry about your implant woes and then sinus issues because of it. An upper one, I imagine. What a mess. Hope that Emma will cheer you up. And I’m sure winter will be here soon, with the coolness. Take care. Kay, you’re one of the bloggers who has mentioned the pain of implant issues and I know that you know how icky it can be. Thanks for your encouragement! And, it’s psychic of you to know it’s an upper one. Emma alternatively makes me laugh and shake my head. I never know if I should take Jane Austen seriously or not. I’m sorry to hear that Allende didn’t work for you. I love most of her books, but every now and then there’s one that doesn’t quite work. I’m glad you have that gorgeous Austen book to look forward to. And those stars are beautiful, too. I wish you three wonderful, painfree weeks and then a sudden drop in temperature, so that you can all be comfortable in the classroom. A point of inquiry: Have you read The Eyre Affair by Jasper Fforde? I’m finishing On the Road by Jack kerouac and starting again Ali Smith’s How To Be Both. I hope you get better from your sinus infection. I have not read The Eyre Affair. Do you recommend it? Should I put it on a list? I own On The Road, but I haven’t read that yet either, nor How to Be Both (which I see everywhere!). Thanks for well wishes, Edgar. Include it in your list. You will love Thursday Next. I will, Edgar, and thank you for book recommendations as I so value your opinion. I love your stars. I’ve picked up Asleep and I’m going to start soon. i was waiting to see when you’d be reading it. I’m amaing fro the second week in August. How does that sound? To bad about the Allende. Yes, the second week of August sounds wonderful for Asleep. I will read that first, before embarking on the Man Booker long list, and I’m glad we’ll be reading it together. 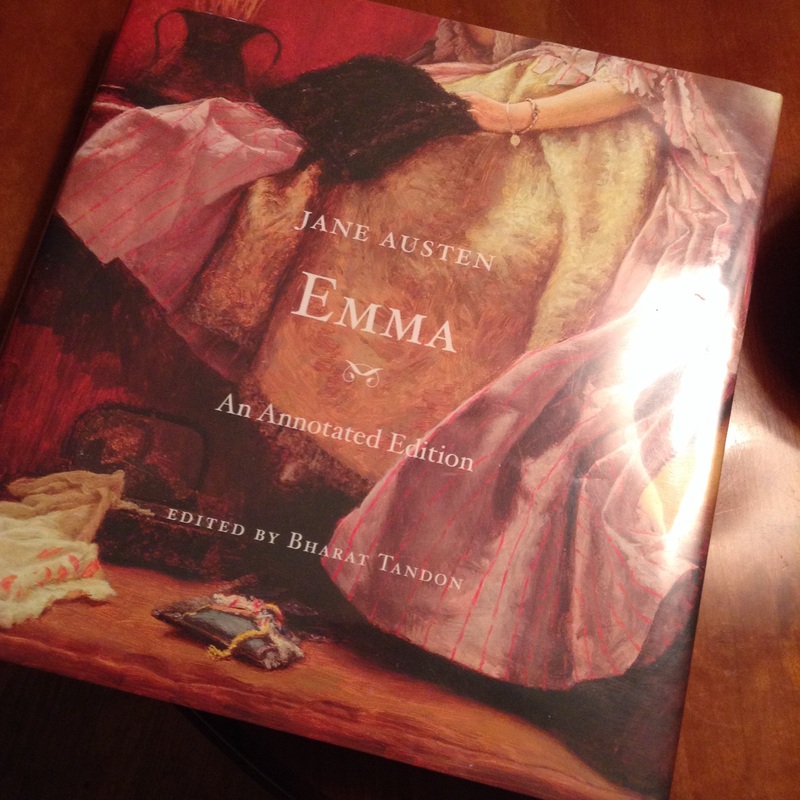 I absolutely love these annotated editions of Jane Austen novels! I can’t believe you were able to get that for only a few dollars! What a great deal… enjoy! $3?! I’m agape. 🙂 I’ve read both Persuasion and Sense and Sensibility in those editions and they made for marvelous rereads. Love those stars and that edition of Emma. I have the P&P in that edition. Hope you are feeling better, now.